Our Most Anticipated Series continues with this look at forthcoming Canadian poetry in Fall 2014. And don't miss our Fiction Preview and Non-Fiction Preview. We've all got so many great books ahead of us. On Malice (September) is the new collection by Ken Babstock, whose Methodist Hatchet won the 2012 Griffin Prize. In Some Mornings (October), legendary publisher and poet Nelson Ball's trademark minimalism takes on a new expansiveness. Prize-winning poet Claire Caldwell's debut collection is Invasive Species (September), in which the calamities of climate change and the dangers of the natural world are juxtaposed against the intimacies of daily life. My Planet of Kites (October) is Stuart Ross and Michelle Winters' translation of the latest book by Marie-Ève Comtois. Celebrated poet Kayla Czaga makes her debut with For Your Safety Please Hold On (September), poems that move in thematic focus from family to girlhood to adulthood, each permeated by Czaga's lively voice and quick-witted, playful language. In his new book, Poems Suitable to Current Material Conditions (October), with mischievous poems about mischievously charming language, Frank Davey shows us how words can be more nimble than we are ourselves, how they take us places we may not have wanted to go, and how likely it is that you’ve already been there. Dead Salmon Dialectics (September), by Derrick Stacey Denholm, draws on scientific studies of salmon recycling in perhumid rain forests to follow the dark and often humorous trial of a young biologist at work in the wildest estuaries of the rainiest place on earth. Cutthroats and Other Poems (September) is the fifth book by Ted Dyck, a collection that pulses with the energy, the anticipation, and the elation that every fly fisherman knows. Award-winning poet Jane Eaton Hamilton's seventh book is Love Will Burst Into a Thousand Shapes (October), with poems that Barry Dempster has called "enlightening, risky, rough, funny as hell, and ultimately very moving." Laura Farina's first book won the Archibald Lampman Poetry Prize in 2005; her latest is Some Talk of Being Human (October), poems that are obsessed with finding a home, returning home, and making a home. The obsessions are broader in Mr Sapiens (September), by Jesse Patrick Ferguson, poems that tell of fighter pilots made redundant by unmanned drones, the secrets hidden in great works of art, a local plague of garden slugs, and the stability of the Earth's core. Fortified Castles (September,) by Ryan Fitzpatrick, asks what might cause retreat into the comforting walls of the self. Cathy Ford's 16th book, Flowers We Will Never Know the Names Of (October), is written in the language of flowers, reimagines the alphabet, and marks the 25th anniversary of the murders of 14 female students in Montreal on December 6, 1989. 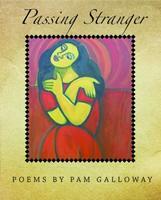 Passing Stranger (October), by Pam Galloway, is a memoir in verse of one woman’s life, poems weaving through a marriage, a desire for motherhood, considerations of fertility and infertility, an eventual divorce and a woman finding herself in late middle age, ready to experience life to the full. Tracy Hamon, whose previous work has been much acclaimed, releases Red Curls (October), a series of poems that move between narrative and lyric, revealing the personas of Austrian artist Egon Schiele and his mistress/model Valerie Neuzil in exquisite detail. Kate Hargreaves follows up her previous book, which examined roller derby culture, with Leak, which uses disjunctive poetic techniques, listing, sorting, organizing of language, as well as a shifting subject, to represent the relationship between language and the body, where bumps and bruises become new ways of understanding the borders and leaks of our everyday existence. Brian Henderson's [OR] (November) might be a collection of cipher poems. Or not. Codes are hidden everywhere, sliding through the atmosphere, slipping into microwave towers, handheld devices, your Twitter account … In Stevie Howell's [Sharps] (October), The Queen launches an advertising campaign to procure our envy; the last unicorn crochets a sweater out of the sisal cords of the books; the falsity of Billy Joel's New York propaganda is grounds for libel; and we discover the one thing you can do "With a sawed-off rifle, a low IQ, and curiosity/about human biology." Assembling the Morrow: A Poetics of Sleep is born from Sandra Huber's experiences as writer-in-residence at a sleep laboratory in Switzerland. Firesmoke (October), by Sheniz Janmohamed, as in her first book, Bleeding Light, continues the tradition of the ghazal—a poetic form dating back to seventh-century Persia. Astatine (August) is the title of the collection, and also the name of the Italian girl who haunts Michael Kenyon's fourth book. Named after a radioactive element whose isotopes endure half-lives of mere seconds, she is simultaneously a disappearing and abiding presence who cajoles and comforts, who questions and points, who often leaves the poet puzzled, electrified, heart-broken, and wanting more. Washita (October), by Patrick Lane, is Lane's first new collection of poetry in years, following a memoir, a novel, and his collected poems in 2011. In The Winter Count (July), Dilys Leman weaves original poems and reconstituted archival texts, including medical reports, diaries, treaties, recipes, even a phrenological analysis, to create a montage that both presents and disrupts the official history of the Métis people. The Things I Heard About You (September) was shortlisted for the 2014 Robert Kroetsch award for innovative poetry and is the debut poetry collection by Alex Leslie, who won acclaim for her first book, People Who Disappear. Michael Lista's second collection, The Scarborough (September), is inspired, in part, by Dante’s Inferno, Virgil's tale of Orpheus’ descent into the underworld for Eurydice, as well as the Paul Bernardo trial. Emily McGiffin, whose first collection, Between Dusk and Night, was a finalist for the Raymond Souster Award and the Canadian Authors’ Association Poetry Prize, releases her second book, Subduction Zone (October). Two Tragedies in 429 Breaths (August), by Susan Paddon, is a book-length series of poems written from the perspective of a daughter who reads Chekhov obsessively while spending a spring and summer caring for her mother, who is dying from pulmonary fibrosis. Inspired by a shipwreck endured by Kerry Lee Powell's father during the Second World War, and by his subsequent struggle with post-traumatic stress disorder and eventual suicide, Powell's first collection, Inheritance (September), is a suite of lyric poems that explores violence, trauma, and mental illness. A Thin Line Between (October), by Wanda Praasma , is a novel-in-verse that is a poignant, and at times humorous, portrait of a Dutch-Canadian family and a close look into a young woman’s exploration of her own being and creative life. Acclaimed poet Lisa Robertson's latest is The Cinema of the Present (September), whose poems ask, What if the cinema of the present were a Möbius strip of language, a montage of statements and questions sutured together and gradually accumulating color? Would the seams afford a new sensibility around the pronoun "you"? The poems in Mohawk spoken-word artist Janet Marie Rogers's newest collection, Peace in Duress (September), pulse with the rhythms of the drum and the beat of the heart. Magpie Days (September), the debut collection by Brenda Sciberras, "picks through the baubles and trinkets of the everyday". In Miscellaneous Wreckage (October), Greg Simison confronts mortality with a fine dose of humour. In This Orchard Sound (September), poet and woodworker John Terpstra takes the reader to an abandoned fruit orchard as it is being bulldozed, asking questions of progress, grace, and the complicity of humanity. Part rural conduit, part urban primer for the disenfranchised, Easy Fix (September), by Blair Trewartha, explores cultural identity with both skepticism and compassion. Don’t Let It End Like This Tell Them I Said Something—Paul Vermeersch’s fifth collection of poetry—is, as its title suggests, a lyrical meditation on written language and the end of civilization. The Game of 100 Ghosts (October), by Terry Watada, is inspired by an old Japanese parlour game of telling ghost stories. The latest from Gillian Wigmore, whose Soft Geography won the ReLit Award in 2008, is Orient (August). Marked by a vision broad enough take in both a pigeon fancier neighbour and a murderer on death row, Shoshanna Wingate tracks the moments that—midstep, midway, midlife—alter us from who we might have been to who we are now in Radio Weather (September). Cycling with the Dragon (September), by Elaine Woo, is a personal investigation of family, love, culture, self, and the helpless feeling of "smallness." House Dreams (October), Deanna Young’s haunted and haunting third collection, is at once a core sample of the life we all live underground, and a view beneath the foundations of the various eras and places that make up one woman’s life story. Janey’s Arcadia (September), by Rachel Zolf, assembles a pirate score of accidental errancies from scanned source documents—missionary narratives, immigration pamphlets, historical writings—to decry the ongoing violence of colonial appropriation and the brutal scrubbing of Indigenous knowledges. Chamber Music: The Poetry of Jan Zwicky (October) is the latest in the Laurier Poetry Series; editors Warren Heiti and Darren Bifford select poems by Zwicky and also contribute a critical introduction to the book and an interview with the poet.